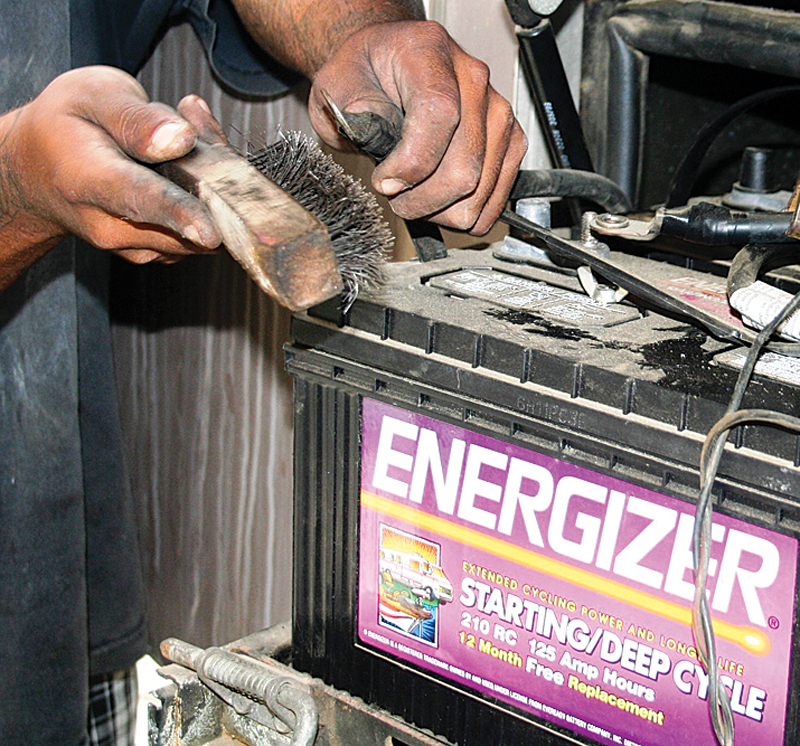 It’s important to preform regular maintenance on your RV batteries to keep them in good health. Remember that even the best quality RV batteries can suffer from corrosion when not properly maintained. Be sure to properly maintain RV batteries to prevent corrosion that can lead to a voltage drop and a reduction in the amperage output. Battery corrosion is identified by a greenish blue or white powder accumulated around the wire connections. Cell batteries with water in them will out-gas when they are charged and when the gasses containing sulfuric acid touch anything that comes in contact, it can lead to corrosion. When out-gassing happens, it causes bubbles to rise through the water acid solution in the battery cells and explode by spreading acid through the cell openings. This causes battery to have a wet film. If the batteries are the sealed type, such as gel, AGM, or any other maintenance free battery, they won’t out-gassing, however, there could still be corrosion from other sources and should still inspect for corrosion. Preventing corrosion on battery terminals is a simple process that should be done once a month. Simply mix a 1/4 cup of baking soda with 1.5 cups of clean water (a ratio of 1:6) and spray the terminals with the solution. Let it stand for at least five minutes and then rinse with a low-pressure spray of water. If corrosion is already present spray the area with the baking soda solution, let sit, and gently remove the corrosion with a wire brush. 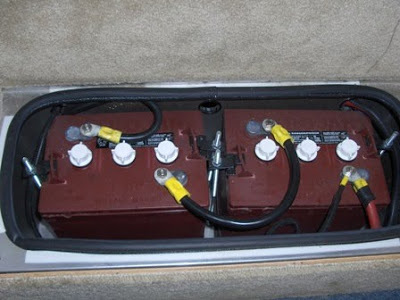 To maintain flooded cell batteries, check out the water content on a monthly basis. Fill the batteries with de-ionized and distilled water if you notice that the water is below the top of the lead plates. Checking it regularly will let you know how often water gets evaporated. There is no need to inspect the water or refill so-called “maintenance free” batteries that come with a sealed top. Gel batteries and AGM batteries have a gel like material in them that holds the liquid inside and does not cause any water loss. These types of batteries do not require refilling or inspection. Even when the batteries are AGM or gel based, the area where they are housed still needs to be regularly checked as the metal parts close to the batteries may suffer corrosion. Keep the area clean and corrosion free with the same solution of baking soda and water that you use to maintain the terminals. Rust and corrosion can be easily be wiped off with the help of this solution, and any flakiness can easily be removed with a wire brush. If you have a lot of rust and corrosion, try a product such as Ospho and once the area is clear of all the rust, apply a coat of pick-up truck bed liner to prevent any further corrosion or rusting. 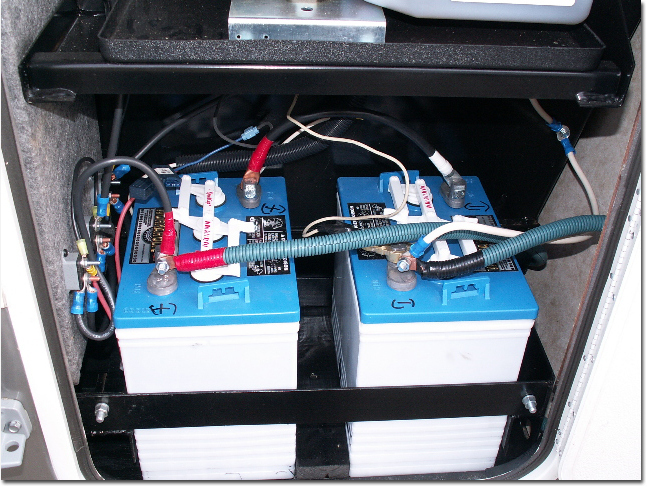 Keeping the connection tight is another important part of maintaining RV batteries. Periodically Check the battery connections, and if you see any loose connections, simply re-tighten them. The life of an RV battery can be increased by following a few simple tips when it comes to charging and discharging. Never let a battery charge drop below 10.5 volts. Never let your battery charge drop below 50%. Hot temperatures and overcharging can kill RV batteries. During hot weather or high usage check the batteries frequently and adding distilled water as needed. RV batteries should be charged in stages. A bulk charge should be performed to return the battery to 90 percent of a full charge during the first few hours. An absorption charge is used for the remaining 10 percent, and then a float charge to keep the battery fully charged. 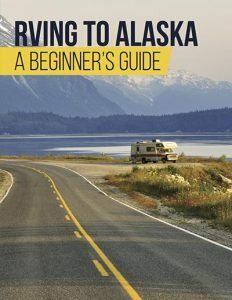 By following these simple maintenance steps and your RV battery will last longer and keep you happily rolling down the road.